Looking at the tournament table and also wanting to save some energy some of the top players at the European Championship in Gjakova opted for grandmaster draws in round six on Tuesday. Fortunately (or we would have nothing to do) not all of them. Radoslaw Wojtaszek and David Navara fought a bloody opening which nevertheless led to an equal ending, by which time both players proved too exhausted to find a win. Ernesto Inarkiev as Black outplayed Baadur Jobava in the opening after Baadur opted for the eccentric Ponziani Opening. Ernesto took the opportunity... to force a draw. God alone knows at what point home preparation ended and over-the-board thinking began in the Marshall Attack played between Ivan Saric and Maxim Matlakov. The Croat eventually won a traditional ending in which White had an extra pawn but Black had good drawing chances. His opponent from St. Pete resigned in a difficult but not entirely lost position. He was probably not feeling too well. The late ex-world champion Vasily Smyslov’s advice ‘the most important thing is to keep people alive’ was followed here, and the end result was that Ivan is now the sole leader in the European Championship. Who said that Leicester was a one-off? Number 30 seed Ivan Saric has taken sole lead – is he the new Jamie Vardy? Francisco Vallejo proved to be better prepared than Denis Khismatullin in what is a fashionable opening. 2) 18.g5 Nd5 19.Bxd7 Rxc3 20.Bxc3 Nxc3 21.Rxc3 Qxc3 22.Bxe8 Bxe2 23.Qf4 Bxd1 24.Qxf7+ Kh8 25.Bc6 Bxb3 26.axb3 Qc1+ with perpetual check (Mamedyarov - Karjakin, 1/2). 15.g4! Chasing the knight from f6 is a smart idea. 17...Nec5? This leads to the forced loss of a pawn. But he should have sacrificed it with: 17...b5! 18.cxb5 (18.Bxd7 Rxd7 19.Nb6 Qd8 20.cxb5 axb5 21.Nxd7 Qxd7 22.Bd4 e5) 18...Rxc1 19.Rxc1 e6 20.bxa6 Qxa6 21.Rc7 Rd8 22.Bf1 d5. In both lines Black has sufficient compensation, for the exchange and pawn respectively. 18.Bxc5 bxc5 19.Bxd7 Rxd7 20.Nxc5! It would be a mistake to win the exchange: 20.Nb6? Qd8 21.Nxd7 Qxd7 – here Black has good compensation thanks to the weakened position of White’s king and his own strong bishop pair. 22.Rd5!? A pawn up, Vallejo provokes his opponent into swapping his queen for two rooks, counting on quickly converting his advantage. 22...Qxd5 23.cxd5 Rxc1+ 24.Kg2 Ra8 25.Qb4 Rcc8 26.Qb7?! The Spaniard mistakenly decides that it’s time to take the bull by the horns. 26.Qe4 Kf8 27.Nd2 Rc5 28.Nc4 was stronger, with a lasting advantage. 27...Bd4? He should have played 27...Rab8!, after which it’s not easy for White to demonstrate an advantage. 2) 28.Qd7 Rc2 29.Nc4 Rxe2 30.Nxd6 Bd4. 3) 28.Qa7 Ra8 29.Qe3 Rc2 30.a4 Rc3 31.Qb6 Rc2 32.Qb7 Re8. 28.Nc4 a5 29.e3! Not the inaccurate 29.Nxa5?! Rcb8 30.Qc7 Rc8 31.Qd7 Rd8 32.Qg4 Rxa5 33.Qxd4 Kg8. 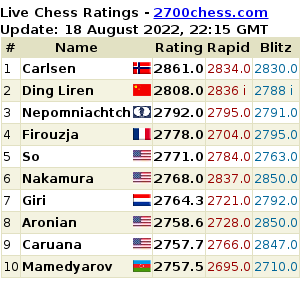 29...Rcb8 30.Qc7 Rc8 31.Qd7 Bc5? 31...Rd8 is more resistant, after which White still has to look hard for the forced win: 32.Qh3 Bg7 33.Qxh7 Rdb8 34.e4! a4 35.Ne3 axb3 36.axb3 Rxb3 37.Ng4 Ra4 38.Nh6. 32.Nxa5 Rd8 33.Qb5 Rdc8 34.a4 Bxe3 35.Nc6 Or he could have accepted the challenge: 35.fxe3!? Rc5 36.Nc6! Rxb5 37.axb5. 24.Rc3?? as Ante played, as after 24...Nxd4! he lost his central pawn. 25.Nxd4 c5 26.Rd3 It was worth trying 26.e3!? cxd4 27.Rxc8 Qxc8 28.exd4 Qa6 29.Bb4 Qe2 30.Qxe2 Rxe2 31.Rc1 Bxd4 32.Rc8+ Kg7 33.Bf8+ Kf6 34.Rc6+ Nd6 35.Bxd6 Kf7 36.Rc7+ Ke8 37.Rxa7 Rxf2 38.Re7+ Kd8 39.Rxh7 Rxf4+ 40.Kh1 Rf1+ 41.Kg2 Rf2+ 42.Kg1 Rxa2+ 43.Kf1, continuing to struggle for a draw. 26...Bxd4 27.Rxd4 Knowing how the game went we could recommend 27.e3!? Bf6 28.Rxd5 Qe6 29.Rd3 b5 30.Bb2 c4 31.Bxf6 cxd3 32.Ba1, and if 32...Qxe3, then 33.Qb2 Ne5 34.fxe5 Rc2 35.Qd4 Qxd4 36.Bxd4 with chances of a draw. 28...d3! 29.Qxd3 d4!! He sacs two pawns to prevent White from moving his queen in front of the bishop. Removing the danger to his king the Pole has retained his material advantage while gaining a positional one: he now plans to invade with his rooks along the c-file. Thanks to this possibility the rook far outweighs the bishop and pawn. 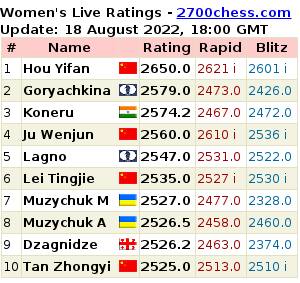 30.Bxd4 Qc6 31.e3 Red8 32.a4 Rc7 33.Ra1 Qf3 34.Rf1 Qc6 35.Ra1 Qd5 36.a5? White’s position is unquestionably already lost, but he should still have avoided making sharp moves, for example he could have instead continued 36.Rd1. Now 36...Rdc8?! 37.e4; or 36...Nd6?! 37.Bf6 makes it harder for Black to win. Black shouldn’t rush with aggressive play here and instead should go for 36...Nh6! with the idea of swapping knights. The prophylactic 37.h3? leaves the g3 pawn defenseless: 37...Qf3. 36...bxa5 37.Qd2 Rdc8 38.Qd1 Rc2 The more precise 38...Nd6 would leave White with zero chances. 39.g4 By playing 39.e4!? fxe4 40.Ng4 White could have awakened his knight and threatened a fork on f6, while 40...Kf8?? is met with the nasty 41.Bg7+. But the simplest way for Black to win would be 40...Qb5 41.Nf6+ Kf8 42.Nxh7+ Ke7. Alexander threatens to capture on а5. The simplest continuation for Black is to defend the pawn with 33...Ra8 and an equal position. 50...Ke6 51.Kh5 Kd5 with the opposition and a draw. 56...Qg7+?? Even if Black’s position is objectively lost, Nils Grandelius’ decision to transpose into a hopeless pawn ending doesn’t make any sense. In fact, after 56...Qe4! there is no obvious win for White. If 57.Qg5+ Kh7 58.h5? then Black can indeed reach a drawn pawn ending: 58...Qg4+! 59.Qxg4 fxg4 60.Kg2 Kh6 61.Kg3 Kxh5 62.Kf4 Kh4. 59.e4?? Zdenko Kozul forgot about his h-pawn. He would have won easily with 59.Kg2 Kh5 60.Kg3 e5 61.e4 f4+ 62.Kg2 (but not 62.Kh3?? d4 63.cxd4 exd4 64.Kg2 Kxh4 65.Kf2 d3 66.Ke1 Kg3 67.e5 Kxf3 68.e6 Kg2 69.e7 f3 with a draw) 62...dxe4 63.c4 exf3+ 64.Kxf3 Kxh4 65.c5. Yesterday, Wednesday 18 May, was a rest day. Experience shows that play improves after rest days. (Translator’s note: actually we all know that the rest day is for commentators and translators. Analysis and translations also improve after rest days!). Round 7 begins today, on 19 May at 16.30 Moscow time (2 hours ahead of London). Submitted by Mark Watkins on 25 May, 2016 - 10:52. I have to agree that the standard of play usually increases after rest days, to say nothing of smaller number of short draws (Round 6 saw a few of these).